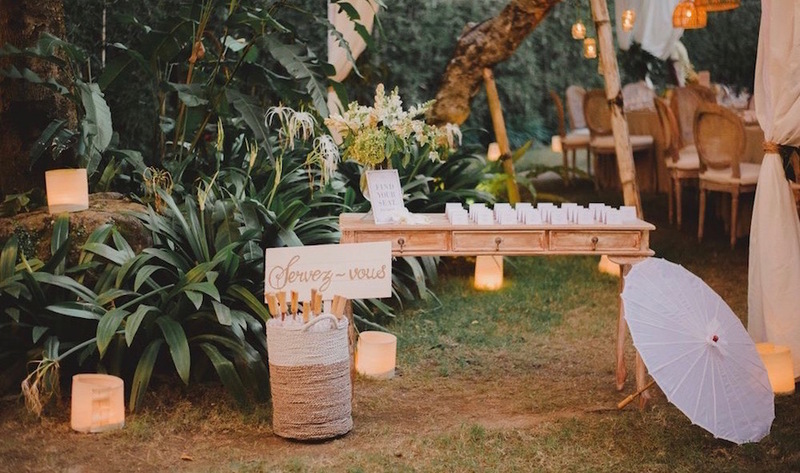 Ever wondered what you get when you mix a tropical, jungle wedding in Bali with an elegant, French twist? We’ll give you a clue. It’s magical. Marriage is all about two lives coming together: two people, two families, two backgrounds, and two cultures. 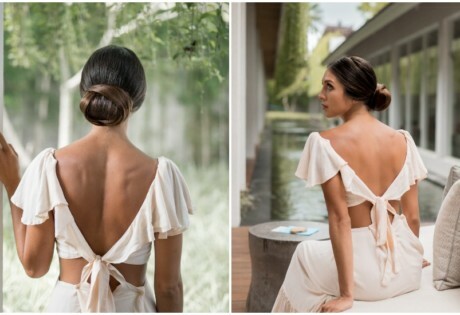 So what better way to signify the merging of two worlds, than with a magical wedding that manages to create a beautiful harmony of two very different styles? 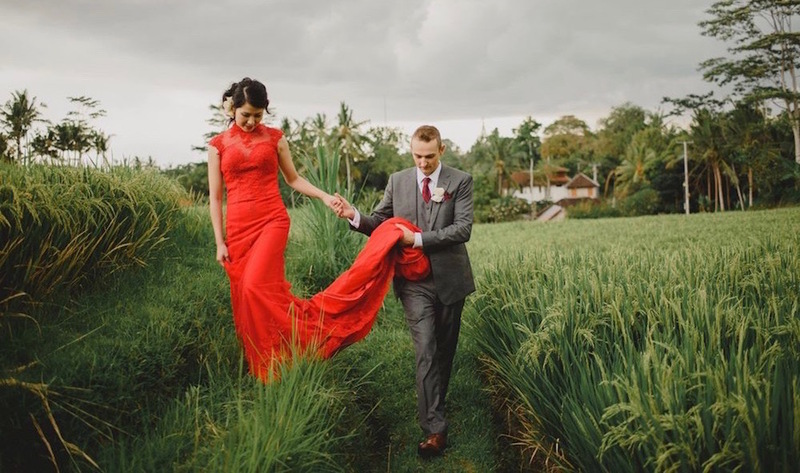 Meet I-Ling and Aaron – a recently wed couple who chose magical Bali for their wedding, but also wanted a French twist to their special day. I-Ling is from Taiwan and quite simply, she loves France. Her favourite singers are Aznavour and Brel, and she can even speak fluent French. So naturally, the couple chose to add “un peu” of France to their union. 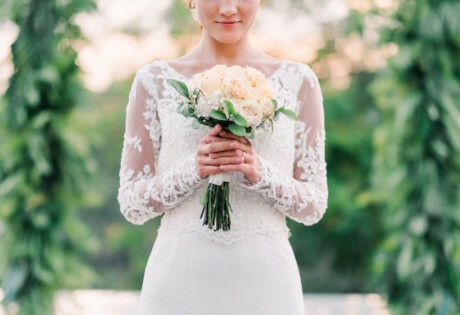 Enter: Call Me Madame, a boutique French wedding planning agency here in Bali. 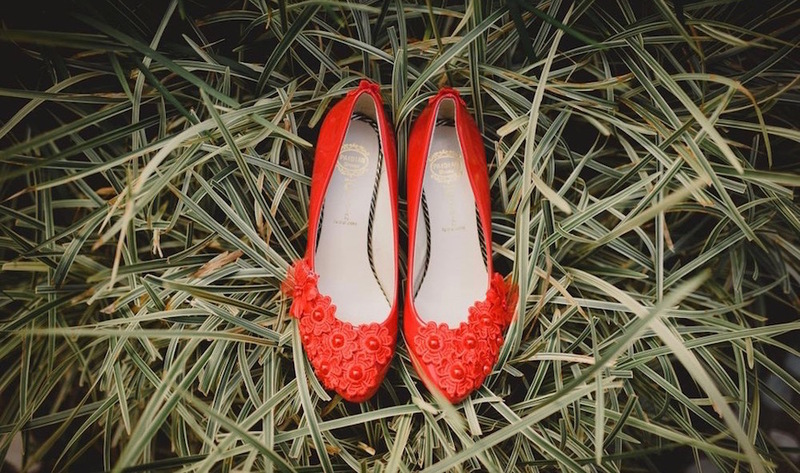 Set in the jungle surrounds of Ubud at The Sayan House, I-Ling and Aaron’s wedding was showered in subtle French touches, and of course, a certain “je ne sais quoi”. 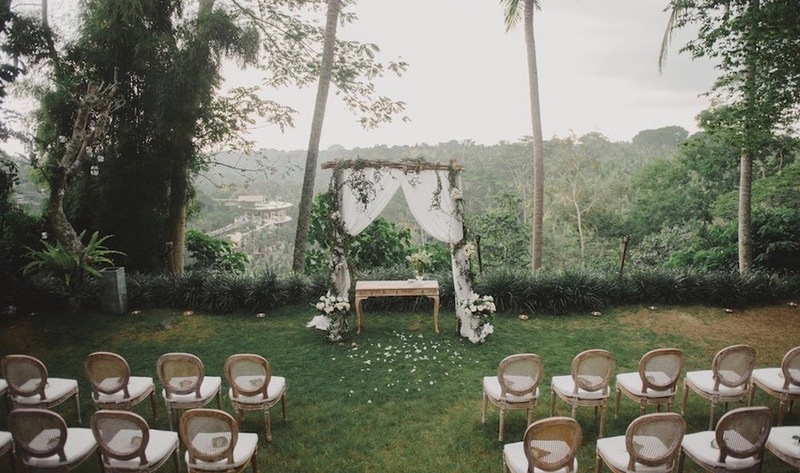 The wedding ceremony took place on the beautiful terrace of the venue, with the Ubud valley as a backdrop for saying “oui”. 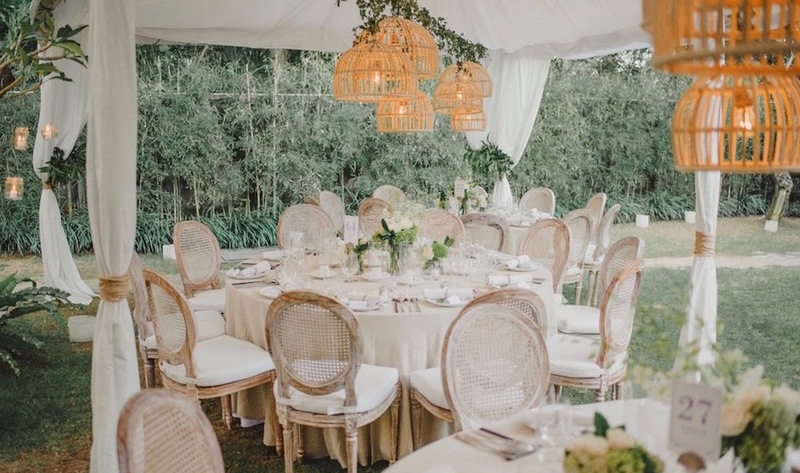 Each guest received a personalised hand-fan, designed by French graphic artist, Anaïs from Pastilles et Petits Pois, as well as white umbrellas for the ladies. 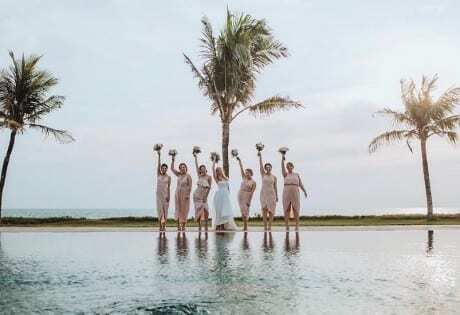 After the gorgeous ceremony and as the sun set on the stunning celebration, guests enjoyed the couple’s signature cocktails on the wood deck of the restaurant, facing the candy coloured sky and Bali’s luxurious vegetation. A few festoon lights completed the magical ambiance. 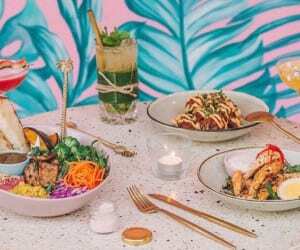 Dinner was then served in the venue’s backyard with a fusion of France and Bali: heavy beige linen tablecloths and Louis wood chairs, against rattan lanterns and local flowers. A soft and elegant blend. To round off the perfect day, I-Ling and Aaron danced for the first time as “Monsieur et Madame” to the timeless “I’m On Fire” by Bruce Springsteen, before it was time to say “bonne nuit and merci”! 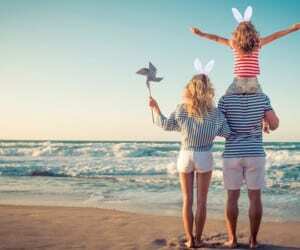 Want to make your own dream day a reality? Email Call Me Madame, or visit the website. 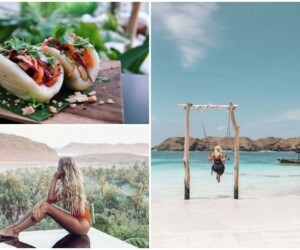 Looking for more inspo on weddings in Bali? 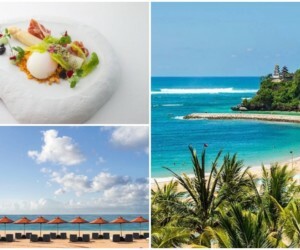 Check out other dream island weddings, or start planning a romantic Bali-moon.